You are here: Home / Recipes / Desserts / 20 Valentine’s Day Treats That Will Make Your Heart Flutter! Valentine’s Day Treats That Will Make Your Heart Flutter! Valentine’s Day and delicious sweets are synonymous with the holiday of love. It is a day to enjoy with your beloved and to show them how much they mean to you. I know it is cliche but, I still enjoy getting surprised with chocolate or sweet treats for Valentine’s Day. Gents, I am sure you have the flowers picked out, special gift ready to give and I know you already have dinner reservations made or dinner plans at home. Now you have to top it all off with a sweet treat. If you’re a gentleman looking for treats to make, I applaud you. I don’t have any doubt that men are great in the kitchen! My Hubs is one of them and when the dudes in our lives make the treat, it makes it that much more special. Ladies, you know the way to his heart is through his stomach. A few of my favorite recipes to make for breakfast or brunch are these Nutella goodies because, well, Nutella is life. Plus, you can make them any time of the day. 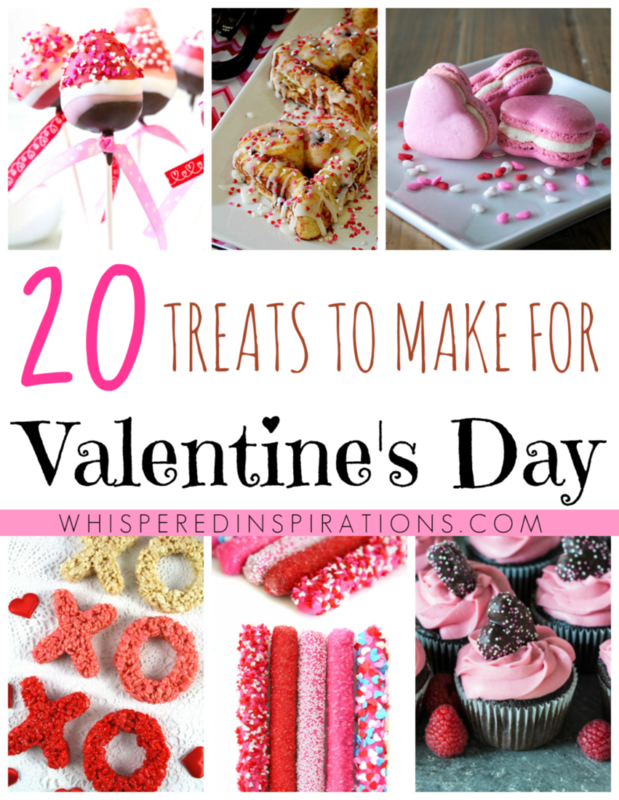 If you’re looking for treats you can make for your Valentine or for ones that you can bring in to the office or child’s class, these 20 Valentine’s Day treats are for you! Do you enjoy sweet treats on Valentine’s Day? So much yum right here. I want to try a whole bunch of these. All of these treats are so colorful, cute and festive! I love V-Day because it involves lots of chocolate and my favorite color: pink! I think I need to make some of these treats for my husband and I. They look so good and so sinful. I cannot wait to try some. Hehe, it is one day! I love those pretty pink macaroons! They are super dainty and almost to cute to eat. You had me at red velvet cake bites – totally my favorite! I will definitely have to try those out this year. Red velvet is my favorite. Thank you so much for sharing all these yummy treats! I can’t wait to share this post with my kids and see which treats they want to whip up! My pleasure, I hope that you try some of them. These treats are so cute! I pinned this post and will come back to it in a few weeks as we get closer to Valentines Day.